I wish you would see Simon and write to me as soon as possable for I must do something about it if it is lost by mail. 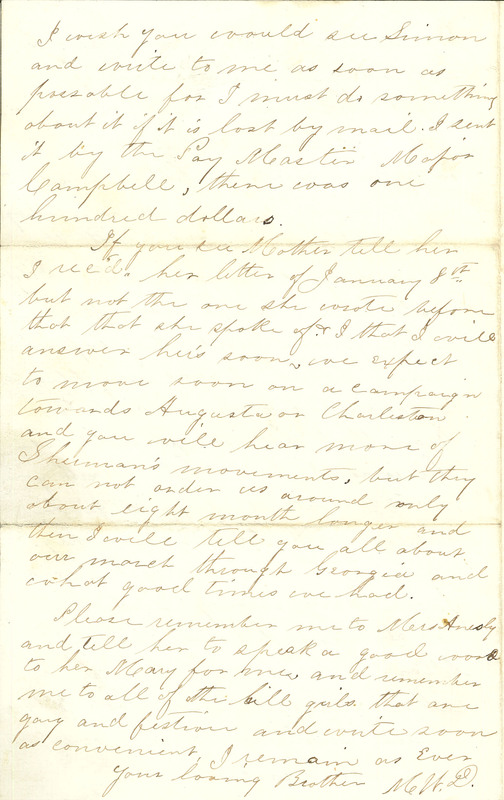 I sent it by the Pay Master Major Campbell, there was one hundred dollars. If you see Mother tell her I rec'd,, her letter of January 8th,, but not the one she wrote before that that she spoke of. & that I will answer her's soon, we expect to move soon on a campaign towards Augusta or Charleston and you will hear more of Sherman's movements, but they can not order us around only about eight month longer and then I will tell you all about our march through Georgia and what good times we had. Please remember me to Mrs Anesly and tell her to speak a good word to her Mary for me and remember me to all of the [hill?] girls that are gay and festive and write soon as convenient, I remain as Ever your loving Brother M.W.D.